The last couple of months have been exceptionally busy, so this blog hasn’t been getting the attention it deserves. All of my time has been spent writing chapters for the SharePoint 2010 Disaster Recovery Guide that John Ferringer and I are putting together. The good news is that John and I have rounded the bend and are heading towards home on completion of the book, so I will be getting back to blogging about topics of greater substance towards the middle of the summer. Yesterday we (the planning committee) announced that SharePoint Saturday Columbus will be taking place at the Conference Center at OCLC in Dublin, Ohio on August 14th, 2010. For those of you not familiar with the central Ohio region, Dublin is just a northern part of the Columbus area. Brian Jackett, Jennifer Mason, Nicola Young, and I have been pulling the pieces together over the last several months, and we finally have enough done that we can announce the event. We’re very excited to be bringing a SharePoint Saturday event to this region of the Midwest! We are actively seeking both speakers and sponsors for the event. If you or someone you know falls into either or both of these categories, please head out to the SharePoint Saturday Columbus site for sponsorship information, session submission forms, and other resources. You can also follow @SPSColumbus on Twitter for more information and announcements in the time leading up to the event. It’s funny to think that the whole SharePoint Saturday experience started about a year ago for me. I’ll be going back to the scene of the crime this weekend when I head to Harrison, Arkansas, for SharePoint Saturday Ozarks. Mark Rackley is reminding the SharePoint community that he is a force of nature by putting all the pieces together to make this event happen. Most SharePoint Saturday events have an organizing committee, but Mark plays all the instruments in this band. It’s simply amazing. Caching is a critical variable in the SharePoint scalability and performance equation, but it’s one that’s oftentimes misunderstood or dismissed as being needed only in Internet-facing scenarios. In this session, we’ll build an understanding of the caching options that exist within the SharePoint platform and how they can be leveraged to inject some pep into most SharePoint sites. We’ll also cover some sample scenarios, caching pitfalls, and watch-outs that every administrator should know. If you happen to be in the Harrison, AR region on Saturday, June 12th, swing by the North Arkansas College. There will be one heck of a SharePoint party going on! In this quick post, I talk about my presentation of “Saving SharePoint” at SharePoint Saturday Houston in a few days (Saturday, May 1st). I’d normally have posted some information about this a bit earlier, but the last few weeks have been a bit of a whirlwind given the new job. This Saturday, May 1st, I’ll be speaking at SharePoint Saturday Houston. I’m already here (in Houston) on business this week, and SharePoint Saturday Houston represents a great way to wrap up the week before heading back to Cincinnati! I’ll be presenting “Saving SharePoint,” the talk that I’ve given (both solo and with my cohort in crime, John Ferringer) at a number of SharePoint Saturday events. In the talk, I discuss SharePoint disaster recovery, key terms and concepts for speaking the “DR lingo,” and the tools that SharePoint comes with to help you protect your data. A substantial portion of the talk also focuses on DR procedures and business practices that anyone tasked with DR responsibilities needs to understand to effectively carry out their duties. If you check this blog with any degree of regularity, then you know that I’ve been relatively quiet for the last couple of months. I haven’t really posted anything new in some time, my tweets have been fewer in number (not that I’m a generator of high traffic on Twitter anyway), and I’ve generally been laying low. This is due in part to writing for the upcoming SharePoint 2010 Disaster Recovery Guide, but writing isn’t really the largest reason I’ve been “sparse” as of late. For a few months now, I’ve been in a state of transition with regard to both my career and my employer. Now that all of the discussions are over, the details have been finalized, and I’m on my way to Houston for a week, I’m excited to announce that I’ve joined Idera as their Product Manager for SharePoint Products! The press release with some additional details can be found at this link. For those of you who may not be familiar with the name, Idera is a software company that is based out of Houston, Texas. Idera makes tools for SharePoint, SQL Server, and PowerShell. In my new role with them, I’ll be part of the team that is working to craft the next generation of Idera’s backup and restore tools. This excites me on so many levels! I’ve actually had a relationship with Idera for the better part of a year now, and it has been nothing but positive. John Ferringer (my DR Guide co-author) and I wrote a SharePoint 2007 Disaster Recovery Overview whitepaper for Idera, and we also presented a webcast on SharePoint Disaster Recovery Essential Guidelines through Idera. On top of that, I was part of an “Ask the Experts” session at the SharePoint Conference 2009 that Idera sponsored, and I am also a member of Idera’s Technical Advisory Board for SharePoint Products. When I had determined that I’d be moving on from my previous employer and mentioned my situation to Idera, elements in the SharePoint universe actually seemed to align in my favor for once. Though I worked with SharePoint as a consultant with my previous company, I was always one step removed from the platform. With Idera, I’ll be working on products that specifically target SharePoint – a big win in my book. About a year and a half ago, I made it a goal to get more involved in the SharePoint community. I wanted to participate more, give back some of what I had gotten, and host of other things. I see this position as a great way to continue those efforts in a way that helps both me and the company I work for. When it comes to SharePoint, I’ve always had one foot in the development world and one foot in the infrastructure/IT pro world. Most of the development work I’ve done for SharePoint has focused on core plumbing, interop with other systems, performance improvement, and general tools. I’d be hard-pressed to find a better fit in this regard than Idera! Though Idera is headquartered in Houston, I’ll still be staying in Cincinnati. I will be in Texas all week, though, to meet with my team, discuss strategies, and get myself “into the game,” so to speak. If you see me around at a conference, SharePoint Saturday event, or anywhere else, please stop me and let me know what you think of Idera’s products. Make sure you share your thoughts on what you think should be done to make them better, too. From now on, I’ll be in a unique position to do something with the feedback! In this post, I discuss some of my activities for the next couple of months. These include the INTERalliance TechOlympics, SharePoint Saturday Michigan, and continuing efforts to get the SharePoint 2010 Disaster Recovery Guide ready for product launch. 2010 is in full-swing, and there seems to be no shortage of activities for me to jump into! If anything, I need more free time to take on some of the stuff I really want to sink my teeth into (such as a SharePoint 2010 CodePlex project I want to have ready for RTM). Until I have something more tangible in hand, though, I’ll avoid talking about that topic any further. The TechOlympics Expo is the type of event every adult geek wishes they had when they were in high school – a weekend lock-in featuring technical competitions, cool toys, games of every imaginable sort, and pretty much everything else that would get a teenage gearhead jazzed-up. The underlying goal of the event is to get high school kids interested in technology, careers in technology, and technical opportunities in the Cincinnati area. The event (on March 5-7) is being put on by the INTERalliance of Greater Cincinnati, and my involvement in the event is kind of a curious thing. My primary client of the past 2+ years is a big backer of (and heavily invested in) the INTERalliance, so naturally they kick-in help whenever events come up. I helped the INTERalliance through a last-minute (and somewhat ugly) technical hurdle involving SMS voting for their PharaohFest event last October, and I suspect that played a part in my being asked to help out with the TechOlympics. With the TechOlympics, I’m part of a team that’s working to make all the “technical stuff” (behind-the-scenes and otherwise) happen. My responsibilities seem to shift a bit each day, but the bulk of what I’ve been working on is coordinating network logistics and services, translating “the vision” into technical infrastructure, providing some guidance on applications being written to support the event, and generally doing my best at “collision avoidance” to ensure that we don’t miss anything important for the event. I’m confident that the event is going to be incredible, and it’s been a lot of fun doing the planning thus far. Seeing everything come together is going to be neat – both for me and for everyone else who has been laboring to make the magic happen! What would an “Upcoming Activities” post be without a SharePoint Saturday announcement! The next one I’ll be attending is SharePoint Saturday Michigan in Ann Arbor on March 13th. I’ll be presenting “Saving SharePoint,” the disaster recovery talk that John Ferringer and I have been delivering at various SharePoint Saturday events around the region. I’ll be flying solo this time around, though, as John has some other things going on that weekend. As always, SharePoint Saturday events are free and open to the public. 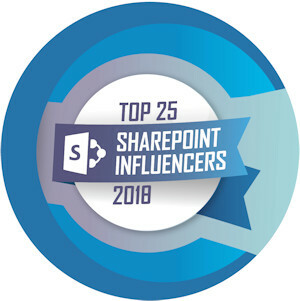 If you have any interest in learning more about SharePoint, getting some free training, or simply networking and meeting other professionals in the SharePoint space, please sign up! This announcement is last, but it’s definitely not least. 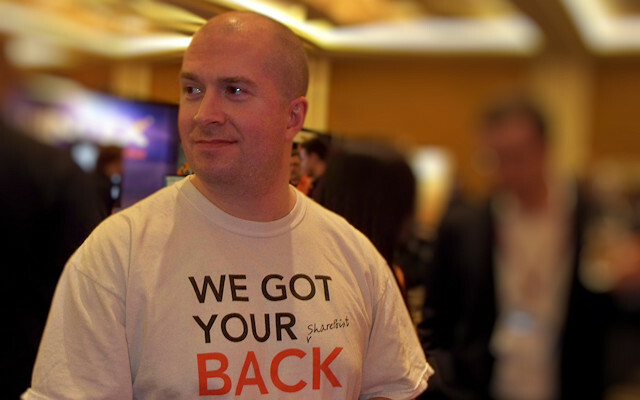 Some of you are aware, but for those who aren’t: John and I have been working on the SharePoint 2010 Disaster Recovery Guide for a while now. I’m not going to lie – it’s slow going. Personally, I’m a very slow writer, and the process itself is exceptionally labor-intensive. Nevertheless, we’re making progress – one page at a time. Our goal (and Cengage’s goal for us) is to have the book ready for SharePoint 2010 RTM. I haven’t seen or heard anything official from Microsoft, but rumor has it that SharePoint 2010 will probably be out sometime in June. If that’s the case, then John and I are on-track. If you have suggestions for us, particularly if you read the first book, we would love to hear them. We’re incorporating a few that we already received (for example, a chapter that covers some real world use-cases), but our ears are open and listening. We know that DR isn’t a topic that gets everyone overly hot and bothered (unless they’ve lost everything at some point, of course), but our goal is to make the book as useful as possible. We’d love your help! 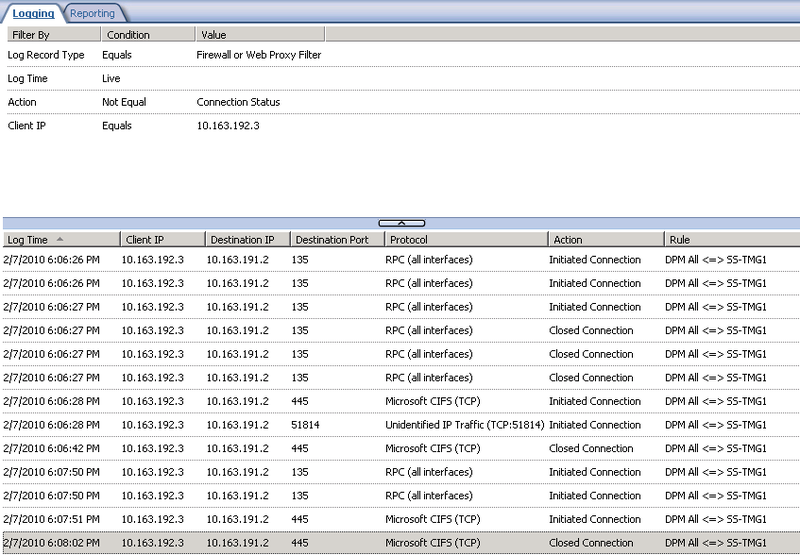 In this post, I discuss a couple of DCOM/RPC snags I ran into while configuring Microsoft’s Data Protection Manager (DPM) 2007 client protection agent to run on my new Forefront Threat Management Gateway (TMG) 2010 server. I also walk through the troubleshooting approach I took to resolve the issues that appeared. In a recent post, I was discussing my impending move to Microsoft’s Forefront Threat Management Gateway (TMG) 2010 on my home network. As part of the move, I was going to decommission two Microsoft Internet Security and Acceleration (ISA) 2006 servers and an old Windows Server 2008 remote access services (RAS) box and replace them with a single TMG 2010 server – a big savings in terms of server maintenance and power consumption. I completed the move about a week ago, and I’ve been very happy with TMG thus far. TMG’s ISP redundancy and load balancing features have been fantastic, and they’ve allowed me to use my Internet connections much more effectively. As a user of ISA since its original 2000 release, I also had no problem jumping in and working with the TMG management GUI. It was all very familiar from the get-go. Call me “very satisfied” thus far. For those unfamiliar with the operation of DPM, I’ll take a couple of moments to explain a bit about how it works. In order for DPM to do its thing, any computer that is going to be protected must have the DPM 2007 Protection Agent installed on it. Once the DPM Protection Agent is installed and configured, the DPM server communicates through the agent (which operates as a Windows service) to leverage the protected system’s Volume Shadow Copy Service (VSS) for backups. Installing the DPM agent typically isn’t a big challenge for common client computers, and it can be accomplished directly from within the DPM management GUI itself. When the agent is installed through the GUI, DPM connects to the computer to be protected, installs the agent, and configures it to point back to the DPM server. No manual intervention is required. On some systems, though, it’s simply easier to install and configure the agent directly from the to-be-protected system itself. A locked-down server (like a TMG box) falls into this category, so I manually put the agent installation package on the TMG server, ran it, and carried out the follow-up PowerShell Attach-ProductionServer (from the DPM Management Shell) on the DPM server. The install proceeded without issue, and the associated attach (on the DPM server) went off without a hitch. I thought I was good to go. I fired up the management GUI on the DPM Server, went into the Agents tab under Management, and discovered that I couldn’t connect to the TMG server. The fact that I couldn’t connect to the TMG server (SS-TMG1) from my DPM box was a bit of an eyebrow lifter, but it wasn’t entirely unexpected. Communication between a DPM server and the DPM agent leverages DCOM, and I’d had to jump through a few hoops to ensure that the DPM server could communicate with the ISA boxes previously. I suspected that an RPC/DCOM issue was in play, but I was having trouble seeing where the problem might be. So, I reviewed where I was at. Without an exception, Windows Firewall will block communication between a DPM server and its agents. I confirmed that Windows Firewall wasn’t in play and that TMG itself was handling all of the firewall action. Examining TMG, I confirmed that I had a rule in place that permitted all traffic between my DPM server (SS-TOOLS1) and the TMG box itself. Strict RPC compliance is another potential problem with DPM on both ISA and TMG, as requiring strict compliance blocks any DCOM traffic. DCOM (and any other traffic that doesn’t explicitly begin RPC exchanges by communicating with the RPC endpoint mapper on the target server) gets dropped by the RPC Filter unless the checkbox for Enforce strict RPC compliance is unchecked. I confirmed that my rule wasn’t requiring strict compliance (as shown on the right). I made sure that my DPM server wasn’t listed as a member of either the Enterprise Remote Management Computers or Remote Management Computers Computer Sets in TMG. These two Computer Sets are specially impacted by a couple of TMG System Policy rules that can impact their ability to call into TMG via RPC and DCOM. I reviewed all System Policy rules that might impact inbound RPC calls to the TMG server, and I couldn’t find any that would (or should) be influencing DPM’s ability to connect to its agent. I also went out to the Forefront TMG Product Team’s Blog to see what advice they might have to offer, and I found this excellent article on RPC and TMG – well worth a read if you’re trying to troubleshoot RPC problems. Unfortunately, it didn’t offer me any tips that would help in my situation. I may have simply had tunnel vision, but I was still obsessed with the notion that strict RPC checking was causing my problems. To see if it was, I decided to fire-up TMG’s live logging and see what was happening when DPM tried to connect to its agent. I set the logging to display only traffic that was originated from the DPM box, and this is what I saw. There was nothing wrong that I could see. My access rule was clearly being utilized (the one that doesn’t enforce strict RPC checking), and I wasn’t seeing any errors – just connection initiations and closes. Traffic from DPM to TMG looked clean. I was frustrated, and I clearly needed to consider the possibility that I didn’t have a good read on the problem. So, I went to the Windows Application event log to see if it might provide some insight. I probably should have started with the event logs instead of TMG itself and firewall rules … but better late than never, I figured. Popping open Event Viewer, I was greeted with the image you see on the left. What I saw was enlightening, for I did have a problem with communication between the DPM agent and the DPM server. The part that intrigued me, though, was the fact that the problem was with outbound communication (that is, from TMG server to DPM server) – not the other way around as I had originally suspected. All of my focus had been on troubleshooting traffic coming into TMG because I’d been interpreting the errors I’d seen to mean that the DPM server couldn’t reach the agent – not that the agent couldn’t “phone home,” so to speak. I knew for a fact that the DPM Server, SS-TOOLS1, didn’t have the Windows Firewall service running. Since the service wasn’t running, there was no way that the agent’s attempts to communicate with DPM could (or rather, should) be getting blocked at the destination. That left the finger of blame pointing at TMG. 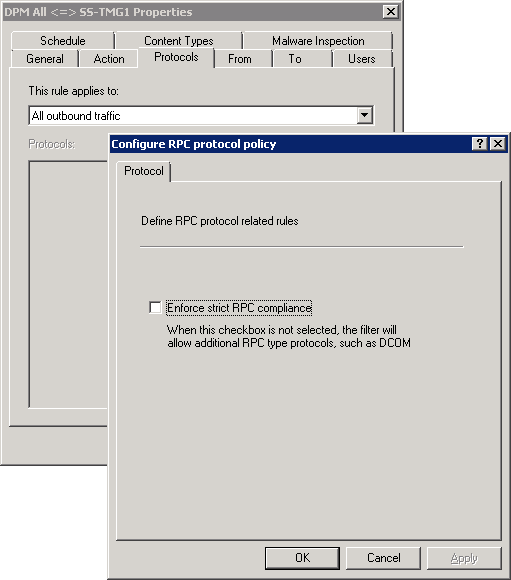 The “a-ha” moment for me came when I saw the firewall rule that was actually governing RPC traffic to the DPM box from TMG. It wasn’t the DPM All <=> SS-TMG1 rule I’d established — it was a system policy rule called [System] Allow RPC from Forefront TMG to trusted servers. System policy rules are normally hidden in the firewall policy tab, so I had to explicitly show them to review them. Once I did, there it was – rule 22. Note that this rule applies to all traffic from the TMG server to the Internal network; I’ll be talking about that more in a bit. I couldn’t edit the rule in-place; I needed to use the System Policy editor. So, I fired up the System Policy Editor and traced the rule back to its associated configuration group. As it turned out, the rule was tied to the Active Directory configuration group under Authentication Services. 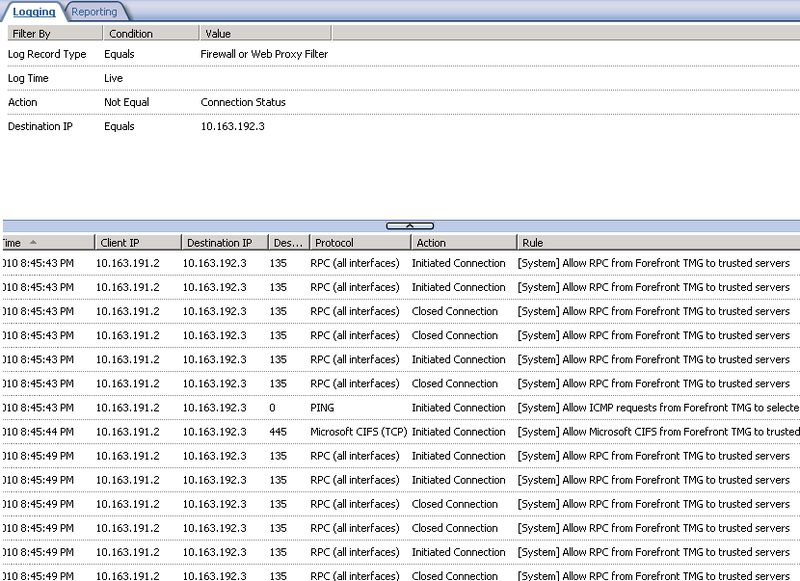 As the picture on the left clearly shows, the Enforce strict RPC compliance checkbox was checked. 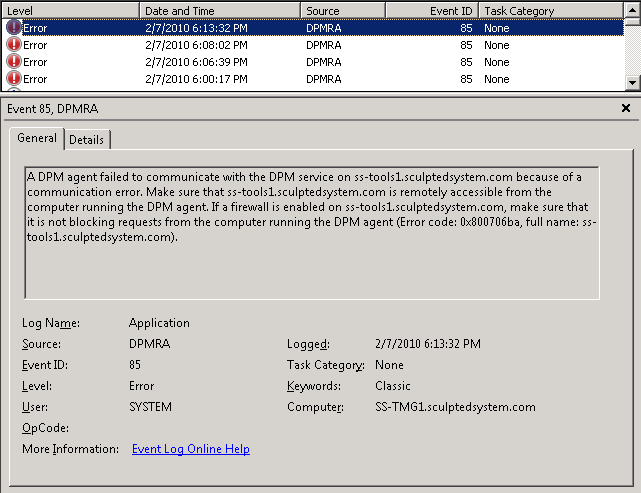 Once I unchecked it and applied the configuration change, the DPM agent began communicating with the DPM server without issue. Problem solved. 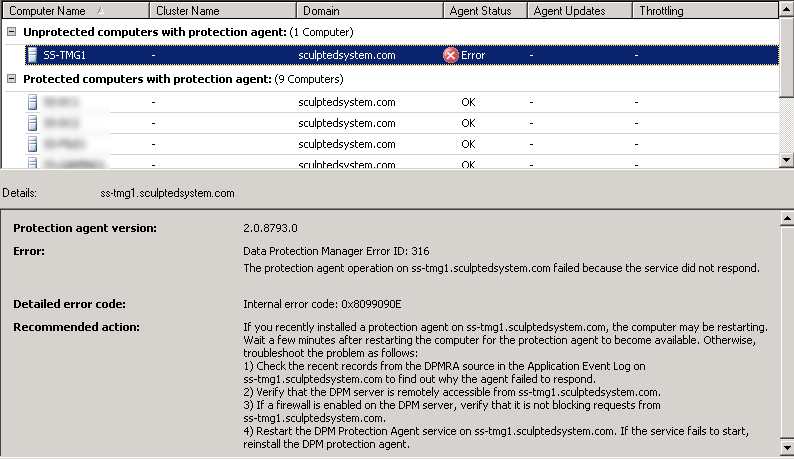 I was fairly sure that I hadn’t experienced this sort of trouble installing the DPM Protection Agent under ISA Server 2006, so I tried to figure out what might have happened. I hadn’t recalled having to adjust the target system policy under ISA when installing the DPM agent originally, but a quick boot and check of my old ISA server revealed that the checkbox was indeed unchecked (meaning that strict RPC compliance wasn’t being enforced). I’d apparently made the change at some point and forgotten about it. I suspect I’d messed with it at some point in the distant past while working on passing AD information through ISA, getting VPN functionality up-and-running, or perhaps something else. Bottom line: TMG enforces strict compliance for RPC traffic that originates on the TMG server (Local Host) and is destined for the Internal network. 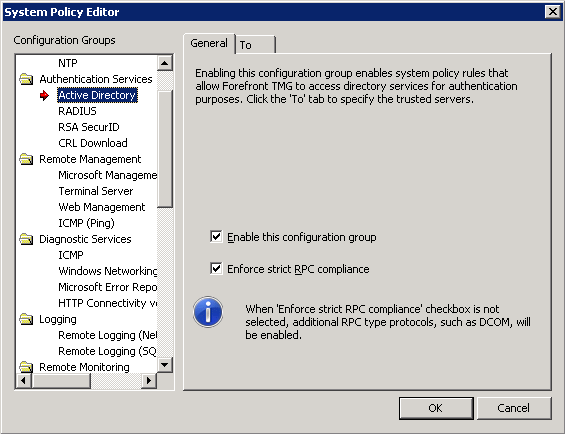 Since System Policy Rules are applied before administrator-defined Firewall Policy Rules, RPC traffic from the TMG server to the Internal network will always be governed by the system policy unless that policy is disabled. In this particular scenario, the DPM 2007 Protection Agent’s operation was impacted. Even though I’d created a rule that I thought would govern interactions between DPM and TMG, the reality is that it only governed RPC traffic coming into TMG – not traffic going out. In reality, any service or application that sends DCOM traffic originating on the TMG server to the Internal network is going to be affected by the Allow RPC from Forefront TMG to trusted servers rule unless the associated system policy is adjusted. The core findings of this post have been documented by others (in a variety of forms/scenarios) for ISA, but this go-round with TMG and the DPM association caught me off-guard such that I thought it would be worth sharing my experience with other firewall administrators. If anyone else moving to TMG takes the “build it from the ground up” approach that I did, then the system policy I’ve been discussing may get missed. Hopefully this post will serve as a good lesson (or reminder for veteran firewall administrators). Thomas K. H. Bittner (former MVP from Germany who runs the Windows Server System Reference Architecture blog) contacted me and shared a blog post he wrote on configuring DPM 2010 and TMG communication; the post can be found here: http://msmvps.com/blogs/wssra/archive/2010/10/20/configure-the-forefront-tmg-2010-to-allow-dpm-2010-communication.aspx. Thomas’ post is fantastic in that it is extremely granular in its configuration of communication channels between TMG and DPM. If you would prefer to lock things down more securely than I demonstrate, then I highly recommend checking out the post that Thomas wrote. In this post, I take a small detour from SharePoint to talk about my home network, how it has helped me to grow my skill set, and where I see it going. Whenever I’m speaking to other technology professionals about what I do for a living, there’s always a decent chance that the topic of my home network will come up. This seems to be particularly true when talking with up-and-coming technologists, as I’m commonly asked by them how I managed to get from “Point A” (having transitioned into IT from my previous life as a polymer chemist) to “Point B” (consulting as a SharePoint architect). I thought it would be fun (and perhaps informative) to share some information, pictures, and other geek tidbits on the thing that seems to consume so much of my “free time.” This post also allows me to make good on the promise I made to a few people to finally put something online for them to see. For those on Twitter who may have seen my occasional use of the hashtag #BasementDatacenter: I can’t claim to have originated the term, though I fully embrace it these days. The first time I heard the term was when I was having one of the aforementioned “home network” conversations with a friend of mine, Jason Ditzel. Jason is a Principal Consultant with Microsoft, and we were working together on a SharePoint project for a client a couple of years back. He was describing his love for his recently acquired Windows Home Server (WHS) and how I should have a look at the product. I described why WHS probably wouldn’t fit into my network, and that led Jason to comment that Microsoft would have to start selling “Basement Datacenter Editions” of its products. The term stuck. Two pictures appear on the right. The left-most shot is a picture of my server shelves from the front. 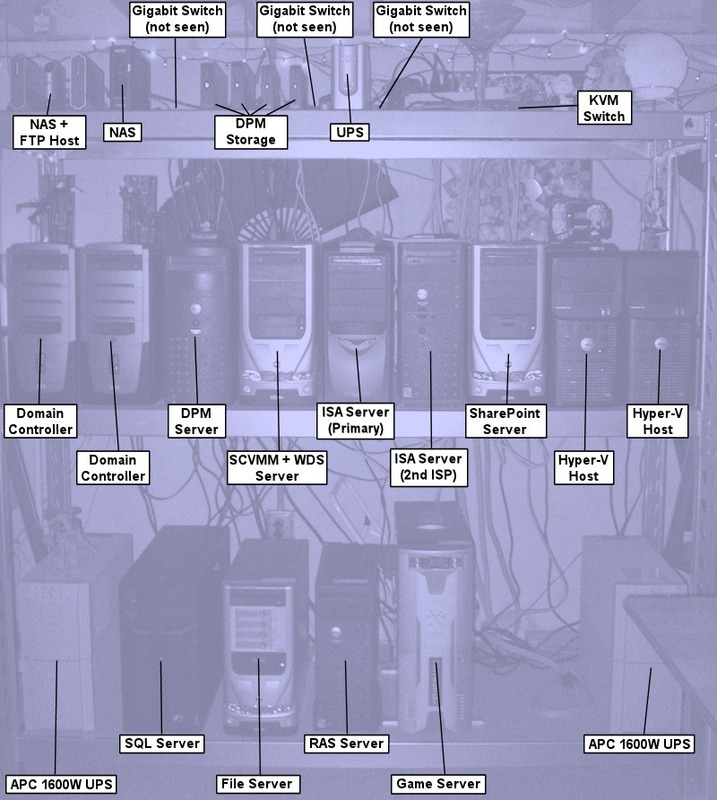 Each of the computing-related items in the picture is labeled in the right-most shot. There are obviously other things in the pictures, but I tried to call out the items that might be of some interest or importance to my fellow geeks. Generally speaking, things look relatively tidy from the front. Of course, I can’t claim to have the same degree of organization in the back. The shot on the left displays how things look behind and to the right of the shots that were taken above. 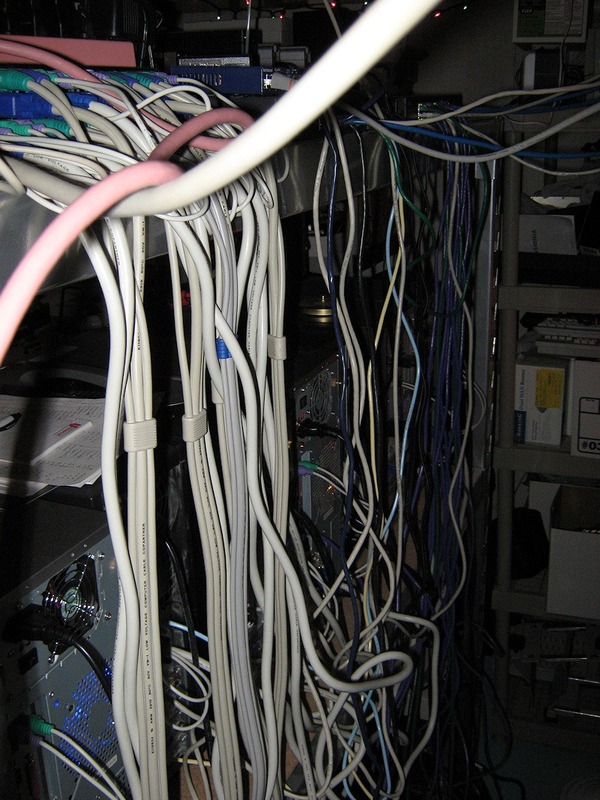 All of the power, network, and KVM cabling runs are in the back … and it’s messy. I originally had things nicely organized with cables of the proper length, zip ties, and other aids. Unfortunately, servers and equipment shift around enough that the organization system wasn’t sustainable. While doing the network planning and subsequent setup, I’m happy that I at least had the foresight to leave myself ample room to move around behind the shelves. If I hadn’t, my life would be considerably more difficult. On the topic of shelves: if you ever find yourself in need of extremely heavy duty, durable industrial shelves, I highly recommend this set of shelves from Gorilla Rack. They’re pretty darn heavy, but they’ll accept just about any amount of weight you want to put on them. Anyone who’s been to my basement (which I lovingly refer to as “the bunker”) knows that I have a thing for dim but colorful lighting. I normally illuminate my basement area with Christmas lights, colored light bulbs, etc. Frankly, things in the basement are entirely too ugly (and dusty) to be viewed under normal lighting. It may be tough to see from this shot, but the servers themselves contribute some light of their own. Why On Earth Do You Have So Many Servers? After seeing my arrangement, the most common question I get is “why?” It’s actually an easy one to answer, but to do so requires rewinding a bit. Many years ago, when I was a “young and hungry” developer, I was trying to build a skill set that would allow me to work in the enterprise – or at least on something bigger than a single desktop. Networking was relatively new to me, as was the notion of servers and server-side computing. The web had only been visual for a while (anyone remember text-based surfing? Quite a different experience …), HTML 3 was the rage, Microsoft was trying to get traction with ASP, ActiveX was the cool thing to talk about (or so we thought), etc. It was around that time that I set up my first Windows NT4 server. I did so on the only hardware I had leftover from my first Pentium purchase – a humble 486 desktop. I eventually got the server running, and I remember it being quite a challenge. Remember: Google and “answers at your fingertips” weren’t available a decade or more ago. Servers and networking also weren’t as forgiving and self-correcting as they are nowadays. I learned a awful lot while troubleshooting and working on that server. Before long, though, I wanted to learn more than was possible on a single box. I wanted to learn about Windows domains, I wanted to figure out how proxies and firewalls worked (anyone remember Proxy Server 2.0? ), and I wanted to start hosting online Unreal Tournament and Half Life games for my friends. With everything new I learned, I seemed to pick up some additional hardware. 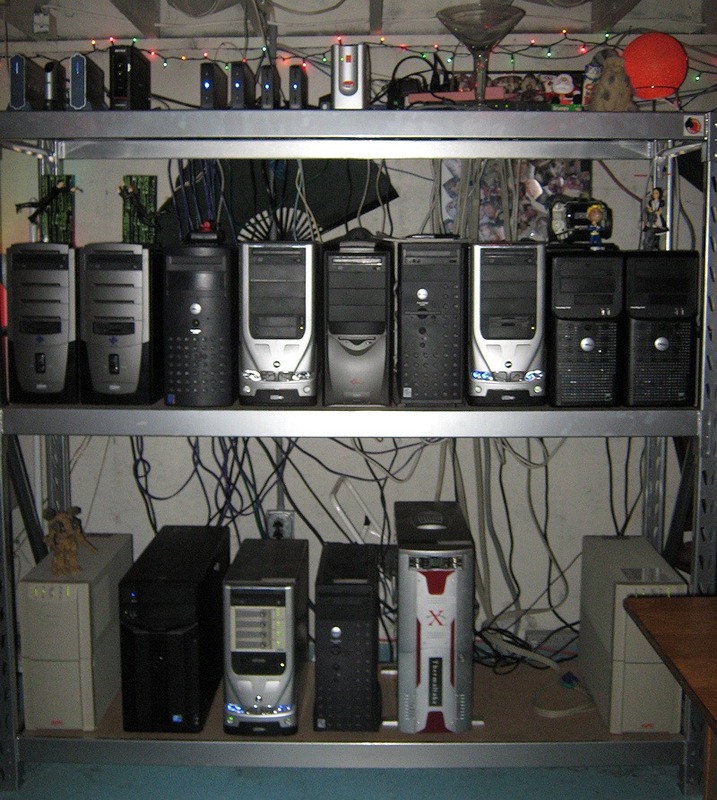 When I moved out of my old apartment and into the house that my wife and I now have, I was given the bulk of the basement for my “stuff.” My network came with me during the move, and shortly after moving in I re-architected it. The arrangement changed, and of course I ended up adding more equipment. Fast-forward to now. At this point in time, I actually have more equipment than I want. When I was younger and single, maintaining my network was a lot of fun. Now that I have a wife, kids, and a great deal more responsibility both in and out of work, I’ve been trying to re-engineer things to improve reliability, reduce size, and keep maintenance costs (both time and money) down. I can’t complain too loudly, though. Without all of this equipment, I wouldn’t be where I’m at professionally. Reading about Windows Server, networking, SharePoint, SQL Server, firewalls, etc., has been important for me, but what I’ve gained from reading pales in comparison to what I’ve learned by *doing*. How Is It All Setup? I actually have documentation for most of what you see (ask my Cardinal SharePoint team), but I’m not going to share that here. I will, however, mention a handful of bullets that give you an idea of what’s running and how it’s configured. All my equipment is UPS protected because I used to lose a lot of equipment to power irregularities and brown-outs. I believe in redundancy. Everything is backed-up with Microsoft Data Protection Manager, and in some cases I even have redundant backups (e.g., with SharePoint data). There’s certainly a lot more I could cover, but I don’t want to turn this post into more of a document than I’ve already made it. Wimpiest Server: I’ve got some straggling Pentium 3, 1.13GHz, 512MB RAM systems. I’m working hard to phase them out as they’re of little use beyond basic functions these days. Preferred Vendor: Dell. I’ve heard plenty of stories from folks who don’t like Dell, but quite honestly, I’ve had very good luck with them over the years. About half of my boxes are Dell, and that’s probably where I’ll continue to shop. Uptime During Power Failure: With my oversize UPS units, I’m actually good for about an hour’s worth of uptime across my whole network during a power failure. Of course, I have to start shutting down well before that (to ensure graceful power-off). Most Common Hardware Failure: Without a doubt, I lose power supplies far more often than any other component. I think that’s due in part to the age of my machines, the fact that I haven’t always bought the best equipment, and a couple of other factors. When a machine goes down these days, the first thing I test and/or swap out is a power supply. I keep at least a couple spares on-hand at all times. Backup Storage: I have a ridiculous amount of drive space allocated to backups. My DPM box alone has 5TB worth of dedicated backup storage, and many of my other boxes have additional internal drives that are used as local backup targets. 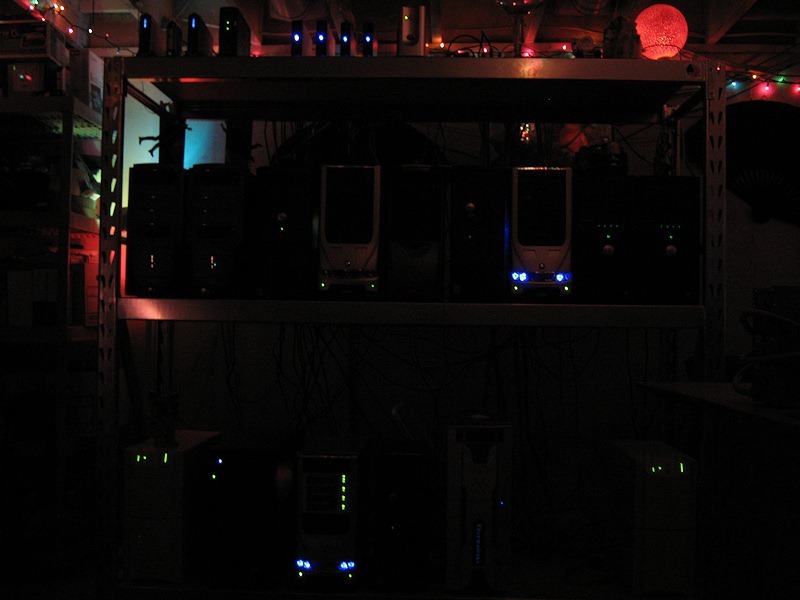 Server Paraphernalia: Okay, so you may have noticed all the “junk” on top of the servers. Trinkets tend to accumulate there. I’ve got a set of Matrix characters (Mr. Smith and Neo), a PIP boy (of Fallout fame), Cheshire Cat and Alice (from American McGee’s Alice game), a Warhammer mech (one of the Battletech originals), a “cat in the bag” (don’t ask), a multimeter, and other assorted stuff. Cost Of Operation: I couldn’t begin to tell you, though my electric bill is ridiculous (last month’s was about $400). Honestly, I don’t want to try to calculate it for fear of the result inducing some severe depression. As I mentioned, I’m actively looking for ways to get my time and financial costs down. I simply don’t have the same sort of time I used to have. Given rising storage capacities and processor capabilities, it probably comes as no surprise to hear me say that I’ve started turning towards virtualization. I have two servers that act as dedicated Hyper-V hosts, and I fully expect the trend to continue. I just purchased a Dell T110 that I’ll be configuring as a Microsoft Forefront Threat Management Gateway 2010 (TMG) server. I currently have two Internet Security and Acceleration Server 2006 servers (one for each of my ISP connections) and a third Windows Server 2008 for SSL VPN connectivity. I can get rid of all three boxes with the feature set supplied by one TMG server. I can also dump some static routing rules and confusing firewall configuration in the process. That’s hard to beat. I’m going to see about virtualizing my two domain controllers (DCs) over the course of the year. Even though the machines are backed-up, the hardware is near the end of its usable life. Something is eventually going to fail that I can’t replace. By virtualizing the DCs, I gain a lot of flexibility (I can move them around on physical hardware) and can get rid of two more physical boxes. Box reduction is the name of the game these days! I’ll probably build a new (virtual) DC on Windows Server 2008 R2; migrate FSMO roles, DNS, and DHCP responsibilities to it; and then phase out the physical DCs – rather than try a P2V move. With SharePoint Server 2010 coming, I’m going to need to get some even beefier server hardware. I’m learning and working just fine with the aid of desktop virtualization right now (my desktop is a Core i7-920 with 12GB RAM), but that won’t cut it for “production use” and testing scenarios when SharePoint Server 2010 goes RTM. If the past has taught me anything, it’s that additional needs and situations will arise that I haven’t anticipated. I’m relatively confident that the infrastructure I have in place will be a solid base for any “coming attractions,” though. If you have any questions or wonder how I did something, feel free to ask! I can’t guarantee an answer (good or otherwise), but I do enjoy discussing what I’ve worked to build. In this post, I cover the upcoming SharePoint Saturday Indianapolis event and a couple of its sessions (including one of my own). You can’t turn a corner these days without running into a SharePoint Saturday event! At the end of this month, Indianapolis will be holding its SharePoint Saturday on January 30th. My disaster recovery (DR) cohort-in-crime, John Ferringer, and I will be presenting “Saving SharePoint” within the event’s IT Pro track. We’ve given the talk together a handful of times, and the session tries to communicate some of the more important concepts from our DR book, such as the importance of undertanding RPO/RTO, tools that are available for DR out-of-the-box, and more. We’ll also be covering how the landscape will be changing a bit for DR in the upcoming SharePoint 2010 release. One of my team members, Steve Pietrek, will also be presenting his new SharePoint and Silverlight presentation – one that I am very anxious to see. Steve’s been doing an exceptional amount of work in “constrained” SharePoint environments recently, and he’s found all sorts of ways to bend Silverlight to his will. I’m sure developers will walk away with some novel ideas. As always, SharePoint Saturday events are free to the public; all they’ll cost you is some time. Sign up today!